I love surprises and come from a long line of family members who like to surprise each other, and always in a good way. My dad loved to trick us into thinking there was no way the family could afford (insert toy, bicycle, stereo, dishwasher) only to surprise us later with exactly what we wanted. And we fell for it every time! In this modern time, we are never surprised by anything. We wake up and a device tells us the time, the weather outside, and how we slept last night. Another device tells us how many steps we need, how many calories we are allowed, and how much water to drink. We get in our cars and they tell us how many minutes it will take to get to work and what the traffic ahead is like. We get to work and our computers tell us what appointments we have, what we should eat for lunch, and who is having a birthday. There is no room for surprise and little space for spontaneity. 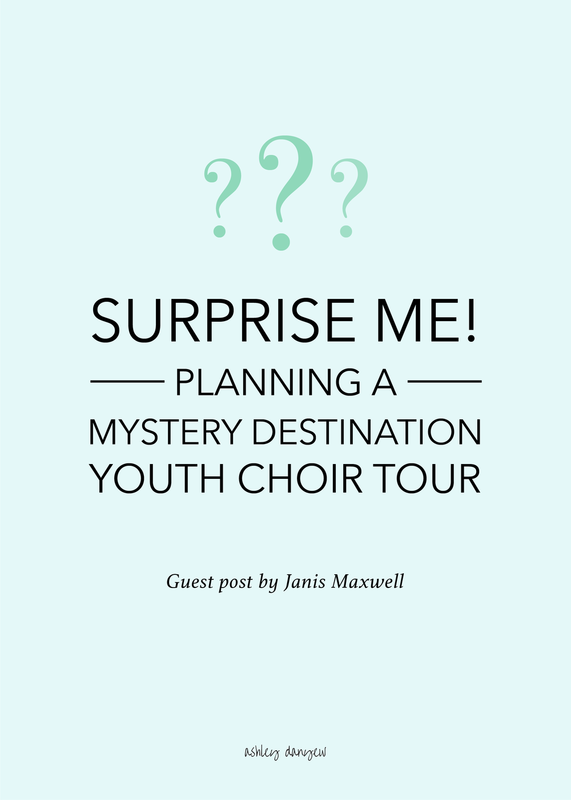 So, I invited our youth choir to enter into a year of mystery. I was hoping for one thing: that they would embrace the idea that God knows the plans He has for us and it is not necessary for us to worry about it. We spent the year preparing music and being faithful to attend choir practice. We didn’t know what we are preparing for and that’s ok! I wanted it to be a great lesson in patience. I wanted the waiting to feel exciting! I wanted them to apply it to the season of Advent and try to imagine what it was like to anticipate the Christ when no one knew the enormous “surprise” God had in mind with the birth of a baby in a manger. Mostly, I prayed that it all turned out well and they would be able to look back on the “surprise” year as one that turned out really terrific. We were all a little nervous going into it, but let me just say it was one of the best tours we have ever done. I won’t bore you with all of the details (you can email me for particulars if you so desire), but I do want to share a few highlights and how we made this a spiritual journey into the unknown together. The first thing to know is this: last summer (2016) our choir tour was to San Francisco. We had never flown on a choir tour. We had never been further West than Houston. We were going to California and we were excited beyond belief. In short, the whole year was about the tour destination, and it should have been. It was amazing, and the minute we returned I realized I would NEVER be able to top such an experience. So, I decided to go to the opposite extreme: 2017 would not be about the destination, because the destination would be unknown! I let the seniors help with the initial planning, so they had a little information. They quickly realized how much fun surprising the kids was going to be, so they ultimately opted to get out of the loop; they wanted to be surprised, too! I had one parent help me and she knew the details. Other than that, no one knew anything. The parents ranged from “whatever” to “what in the world?” but no one complained. Note: I have been in this church for nineteen years, so their trust in me is very high. I would not recommend this type of excursion until you have been in a church for at least five years. During the year, whenever the kids would start begging for information, I would remind them that we don’t ever know what tomorrow brings. We talked about God’s plan for each of us and how we don’t know the things He has in store for us. We talked about “bumps” in the road of life and how they sometimes lead to great experiences and adventures. We discussed “the best laid plans” and how, even though we want to be in control it is always better to listen to God and try our best to follow His will for us. All along the way, the kids tried to guess each day where we were going next. Sometimes they guessed correctly and other times they were completely wrong. In the end, we all agreed that what God has planned for us usually exceeds our own expectations and ideas. What a great lesson for our older high school kids as they enter a time in life when they are trying to make the overwhelming decision of an area of study or choose a career: things don’t always go as planned, and that is sometimes for the better! My hope was that we could take the tour emphasis off of the destination and put it back on the journey. All year I reminded the kids that this tour was like our lives. We don’t know what is ahead, but we make a commitment, we show up to practice, and we get on the bus. After all, our final destination is not a place on a map. We end up, as the Irish Blessing says, within the palm of God’s hand. Allow yourself a surprise today. Walk outside and be surprised at the beauty of the earth. Call a friend you have not caught up with for a while. Take a different route to work. Go to the nursery/preschool and watch babies for a few minutes. The whole world is a surprise to them and their faces show it. And, when you get interrupted today (and you know you will) take it as a sign that even after all these years, God is still trying to surprise you! P.S. Have a youth-choir-related topic you'd like to see Janis write about in the future? Leave a comment below!